Oh, how I’ve waited for this day. Finally, the days of handwriting MDX queries in Datazen server are over for me. Thanks to the latest server update, the server can now handle MDX generated from a tool like SQL Server Management Studio or SQL Server Report Builder. Not only that, I have additional control over the field names and field types when the query results are returned. 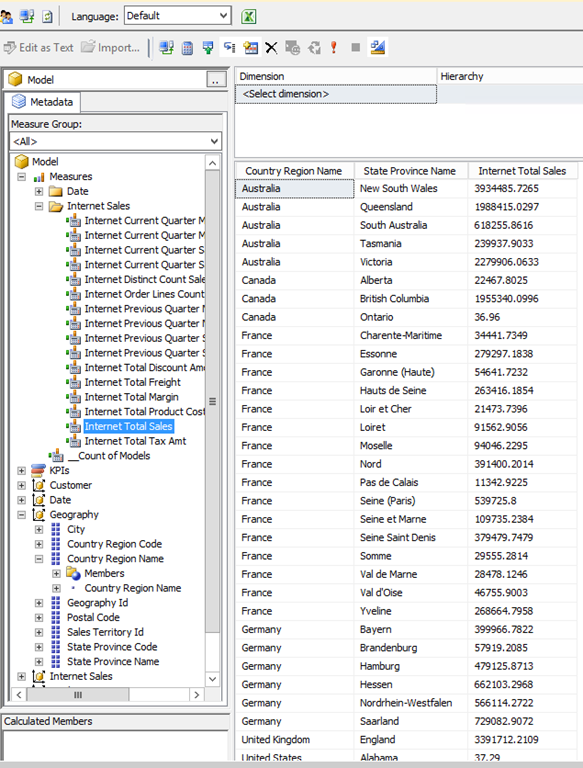 Let me show you how it works using SSMS – Right-Click on your database and select browse – The handy Model browser comes up where I can drag and drop my fields from my model and build my query. I’ll bring in Country Region Name and State Province Name from Geography plus Internet Total Sales from my Measures. My results are returned like so – Now I want to get the query that generated by this to use with Datazen. 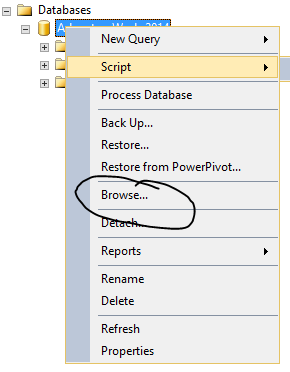 I can simply toggle off Design mode by clicking this button in the toolbar – And my query text appears – I’m going to copy this text and switch over to my Datazen control panel and paste this query as a new data view under my SSAS data source – Before today’s update, when I hit next, this query wouldn’t work. It would just bring back a blank result set. But now, a couple things now happen. The first one is, a new screen appears in the wizard – I now have the ability to change the display name, the data types being returned from the data source, and exclude certain fields from the result set. This gives me a lot of flexibility I didn’t have previously. So I’ll change my display name to the following – I hit next and Whammo (that was for Mike Gannotti) – the query not only works, it is all cleaned up and ready for my Datazen dashboards – This is great news for folks who love Datazen, but don’t love handwriting their MDX queries. 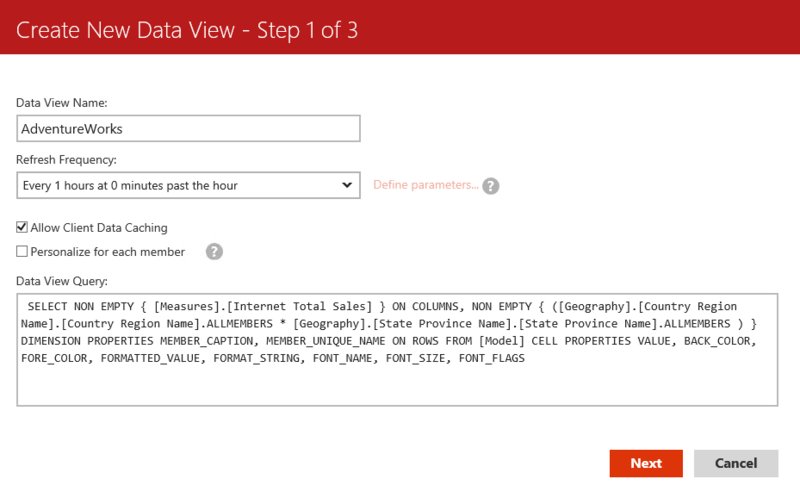 And the new abilities to change the display name, data type and field list is there for all datasets, not just SSAS. So SQL Server customers, grab the new server build of Datazen and take advantage of this great new functionality. Thanks for reading! Christopher, count me in! I’m going to pull this down and give it a shot. Its great to get some help with the MDX and its application in the data view. Thanks for the great post. Very nice post! This update was very helpfull. The workaround needed to put running a mdx query was very annoying and some times took much more time to proccess than the simple query. We did the update but now we are facing some problems with data views related to Oracle OLE DB Provider, As we use brazilian language the driver returns the data view with decimal numbers added to the integer part, for example: correct number is 10.234,00 and Datazen is bringing 1,023,400.00. Do you think it could be fixed in some how? The new build addressed this Marcus. I have updated the link in the blog post to point to the new download. The link to download new version is not available anymore. Do you know what could be the reason? Christopher, good morning, the update link is not more available. My Datazen service version is 3.0.2908, and I don’t find any update. You know where I can get the update? Today, I can’t download new datazen server, link not found, Please tell me, what happened. The blog post has been updated with the new link to the download. This is great article. I was almost at dead end before coming across this article. 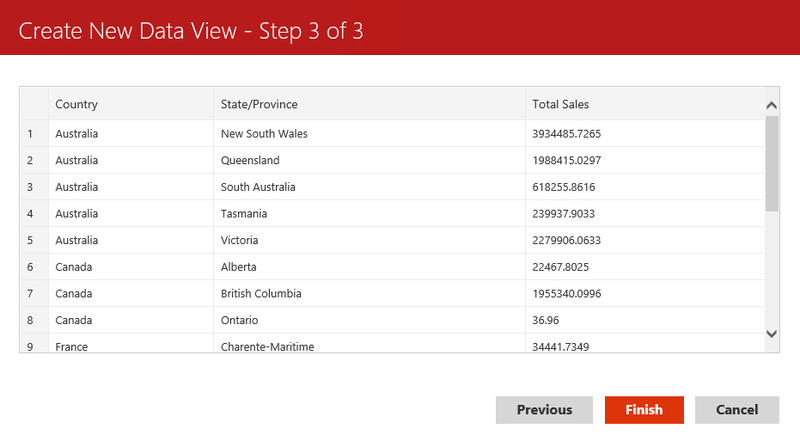 I downloaded latest build and I am able to create few dashboards connecting to SQL OLAP Tabular models. I have one question. Is there anyway to format columns when I am using Simple grid or selection list (font size or center your content etc). any help greatly appreciated.